1Excludes L model. Not available with special financing, lease and some other offers. See participating dealer for details. 2Disclosure: *Prices shown on this site may include rebates and other discounts which are not compatible with alternative financing options, dealer not responsible for unintentional typographical errors or computer system errors. Please contact us for full details on all offers. Tax, title, license and dealer fees (unless itemized above) are extra. Not available with special finance or lease offers. 3Disclosure: *Prices shown on this site may include rebates and other discounts which are not compatible with alternative financing options, dealer not responsible for unintentional typographical errors or computer system errors. Please contact us for full details on all offers. Tax, title, license and dealer fees (unless itemized above) are extra. Not available with special finance or lease offers. 4Disclosure: *Prices shown on this site may include rebates and other discounts which are not compatible with alternative financing options, dealer not responsible for unintentional typographical errors or computer system errors. Please contact us for full details on all offers. Tax, title, license and dealer fees (unless itemized above) are extra. Not available with special finance or lease offers. 5Excludes L model. Not available with special financing, lease and some other offers. See participating dealer for details. 6Must qualify through GM Financial. Not available with special finance, lease, or some other offers. Take delivery by 04-30-2019. See dealer for details. 7Excludes L models. Monthly payment is $13.89 for every $1,000 you finance. Example down payment: 5.2%. Must finance with GM Financial. Some customers may not qualify. Not available with lease and some other offers. Take new retail delivery by 4/30/2019. See dealer for details. 1Disclosure: *Prices shown on this site may include rebates and other discounts which are not compatible with alternative financing options, dealer not responsible for unintentional typographical errors or computer system errors. Please contact us for full details on all offers. Tax, title, license and dealer fees (unless itemized above) are extra. Not available with special finance or lease offers. 2Disclosure: *Prices shown on this site may include rebates and other discounts which are not compatible with alternative financing options, dealer not responsible for unintentional typographical errors or computer system errors. Please contact us for full details on all offers. Tax, title, license and dealer fees (unless itemized above) are extra. Not available with special finance or lease offers. 3Disclosure: *Prices shown on this site may include rebates and other discounts which are not compatible with alternative financing options, dealer not responsible for unintentional typographical errors or computer system errors. Please contact us for full details on all offers. Tax, title, license and dealer fees (unless itemized above) are extra. Not available with special finance or lease offers. 4Must qualify through GM Financial. Not available with special finance, lease, or some other offers. Take delivery by 04-30-2019. See dealer for details. 5Not available with special finance or lease offers. Take delivery by 04-30-2019. 6Excludes L models. Monthly payment is $13.89 for every $1,000 you finance. Example down payment: 5.2%. Must finance with GM Financial. Some customers may not qualify. Not available with lease and some other offers. Take new retail delivery by 4/30/2019. See dealer for details. 1Disclosure: *Prices shown on this site may include rebates and other discounts which are not compatible with alternative financing options, dealer not responsible for unintentional typographical errors or computer system errors. Please contact us for full details on all offers. Tax, title, license and dealer fees (unless itemized above) are extra. Not available with special finance or lease offers. 2Disclosure: *Prices shown on this site may include rebates and other discounts which are not compatible with alternative financing options, dealer not responsible for unintentional typographical errors or computer system errors. Please contact us for full details on all offers. Tax, title, license and dealer fees (unless itemized above) are extra. Not available with special finance or lease offers. 3Disclosure: *Prices shown on this site may include rebates and other discounts which are not compatible with alternative financing options, dealer not responsible for unintentional typographical errors or computer system errors. Please contact us for full details on all offers. Tax, title, license and dealer fees (unless itemized above) are extra. Not available with special finance or lease offers. 4Not available with special finance or lease offers. Take delivery by 04-30-2019. 5Must qualify through GM Financial. Not available with special finance, lease, or some other offers. Take delivery by 04-30-2019. See dealer for details. 6Excludes L models. Monthly payment is $13.89 for every $1,000 you finance. Example down payment: 5.2%. Must finance with GM Financial. Some customers may not qualify. Not available with lease and some other offers. Take new retail delivery by 4/30/2019. See dealer for details. 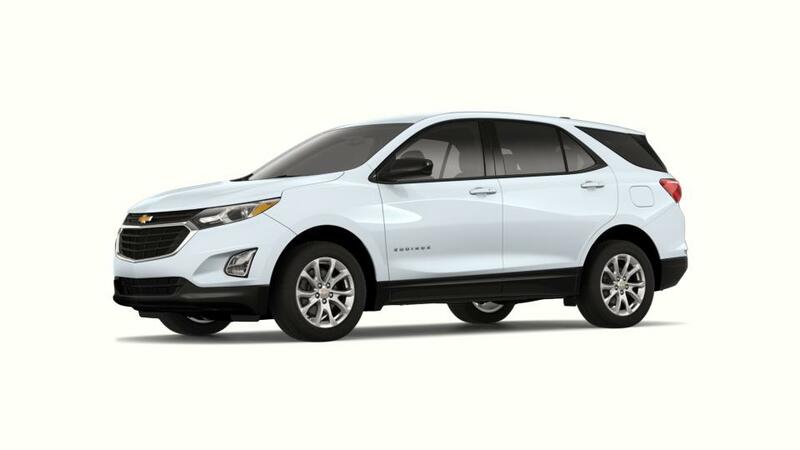 The Chevrolet Equinox is a small SUV that is a joy to drive and fuel-efficient. You will save on gas, thanks to this amazing vehicle. It also has a variety of state-of-the-art safety features like low-speed automatic forward braking and a rear vision camera to help you prevent collisions. Plus, tech lovers can enjoy the capability to connect up to seven devices to built-in Wi-Fi. With plenty of storage and seating for up to five passengers, the Equinox has space for you, your family, and all of your things. This hard-working crossover is sure to meet your requirements in your next vehicle. Bob McCosh Chevrolet Buick GMC Cadillac in Columbia near Moberly hosts a wide inventory of vehicles for you to choose from. Select the color and options that are perfect for you. Feel free to call us at (573) 355-9946 or contact us online to schedule a test drive. We will be happy to help you!